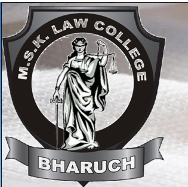 Mahamandleshwar Shri Krishnandji Law College, Bharuch is Private Aided, Affiliated College. Mahamandleshwar Shri Krishnandji Law College, Bharuch is affiliated to Veer Narmad South Gujarat University, Surat and approved by Bar Council Of India and also from University Grants Commission (UGC). Mahamandleshwar Shri Krishnandji Law College, Bharuch was established in 1968. Mahamandleshwar Shri Krishnandji Law College, Bharuch offers various graduate courses as well as Post Graduate courses. Mahamandleshwar Shri Krishnandji Law College, Bharuch is affiliated to Veer Narmad South Gujarat University, Surat. List of facilities available at Mahamandleshwar Shri Krishnandji Law College, Bharuch for students. This page was last modified on 31 July 2015 at 14:07.